A header manifold heat shield like Lava Header Armor helps your engine produce more power by keeping more heat in your headers and exhaust system. That in turn increases exhaust gas temperatures and exhaust gas velocity for improved exhaust flow and efficiency for scavenging and other factors. 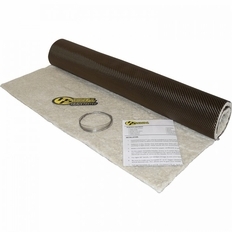 When Heatshield Products introduced Header Armor, it revolutionized the way people thought about header wraps. Now our Lava Header Armor brings the great look of Lava Shield with heatshielding capabilities with a carbon-fiber look. Unlike header wraps, which completely cover individual header tubes, the Lava Header Armor is a single shield (or made by the user into multiple) that covers one half of the primary tubes. This header heat shield stops 50 percent more heat from the exhaust system compared to an exhaust wrap and stops up to 80 percent more than a ceramic coating. By covering one side of the header you are reducing more under hood heat and still allowing the primary tubes to breathe. As a result, it will not void most header corrosion warranties creating a win-win situation. More heat reduction than traditional exhaust header wraps in a warranty friendly method because the pipes can breathe. Lava Header Heat Shield significantly reduces under hood heat, which can help protect wiring and fuel lines, and allow your car to run cooler. Under hood temperatures can drop as much as 60 percent which results in lower air intake temperatures giving you more power. The specially formulated BioCool thermal-barrier material is one of the most efficient thermal-barrier materials on the market, keeping heat where it should be while not having the itchy and heavy smoke drawbacks of less capable fiberglass-based materials. This combines for a sustained temperature rating of 1,800 degrees Fahrenheit and intermittent temperature rating of 2,200 degrees Fahrenheit to make the Lava Header Armor one of the most effective thermal barriers you can buy. Its design makes installation a breeze, and you will not need to remove the headers. The Lava Header Armor can be removed and reinstalled as needed for maintenance and engine work.